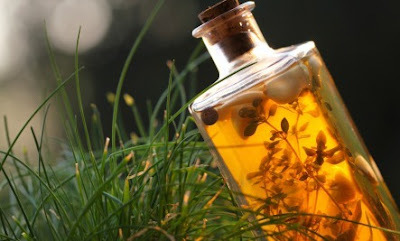 Four thieves vinegar (also called Marseilles vinegar, Marseilles remedy), is a concoction of vinegar (either from red wine, white wine, cider, or distilled white) infused with herbs, spices or garlic that was believed to protect users from the plague. The recipe for this vinegar has almost as many variations as its legend. The general story goes that during a time of plague (it is assumed to be the Black Plague), quarantines were instituted, and a gang of four thieves moved from house to house, robbing the tenants of their belongings. The thieves grew richer, and their health remained unaffected by the plague. Eventually, they were caught and sentenced to death. Clever and cunning, they bargained their lives by sharing their secret, a magical formula known to us today as Four Thieves Vinegar. The thieves managed to save their lives and escaped from the afflicted town. Nobody knows whether they kept their loot or not. While its origins are in western Europe (possibly England, Italy, or France), it came to the U.S. through New Orleans, where it was adopted by the Voodoo and Hoodoo communities. Yes, that's right- cultural appropriation. Today, it is used in spells for banishing, healing, and protection spells. Given the number of recipes out there, I've always liked Judika Illes's recipe in her "Element Encyclopedia of 5000 Spells." Peel and crush garlic cloves, and add them to the vinegar. You cannot have too much garlic, especially if you plan to use Four Thieves Vinegar for its healing and immune-boosting properties. Traditionally, each thief contributed one ingredient, so choose one of the following for each of the four thieves, making a total of four additional ingredients:black pepper (peppercorns are best), whole cayenne or other chili pepper, coriander, lavender, mint, rosemary, rue, sage, thyme, or wormwood. Combine all ingredients. Let sit for four days, shaking once daily, before using. Note: If you are using fresh herbs, there is a tendency for the garlic to take on their green color. It doesn't hurt anything, but if you think it unsightly, you can boil the garlic in vinegar and allow it to cool completely before crushing and adding to the recipe.